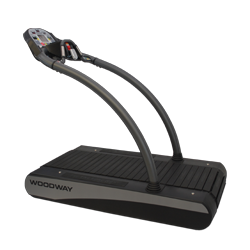 The Woodway Desmo H treadmill presents a really good design, superior quality, an excellent performance… but a really expensive price tag, as well! 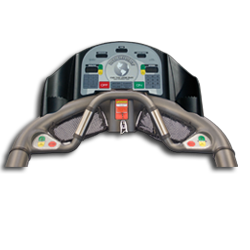 Woodway has always been known for the unique designs and outstanding quality of its fitness products. If you have one, surely, this machine will make you the talk of the town by your friends and neighbors. It is the perfect centerpiece in your fitness room! Combining style and performance, there is nothing more you will look for in Woodway Desmo H treadmill. Its unique design and bulky size are perfect for any type of runner, whether you’re just a beginner or already an experience athlete. Here are just some of the features that you should look forward to with this magnificent machine. 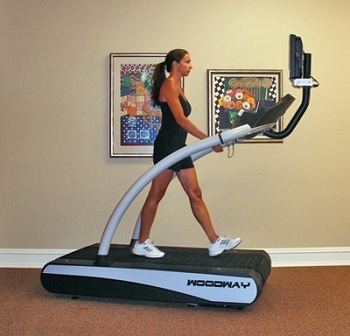 The Desmo H treadmill is manufactured with patented slat-belts transportation system. The lateral belts are created zero-stretch and zero-slip, providing you comfortable and safe strides. Moreover, the rubber surfaces are vulcanized and the ball bearing rail guide is near frictionless thus, wear and tear on the machine is minimized. Plus, the advanced SlatFlex shock absorption system will rid you off stress, impacts, and tensions while working out. Built to last a lifetime, the Desmo H treadmill can carry a maximum user weight of 800 lbs. when used for walking and up to 500 lbs. when used for running. And with an emergency stop magnet and safety lanyard, you can be sure that your runs will be as safe as possible. For a better user experience, the machine features handrail controls for speed, incline, and emergency stop that are easy to use. It also comes with multiple LED displays that show you important stats including time, distance, speed, incline, heart rate, and calories burned. It is also compatible with CSAFE fitness communications. While the normal speed range of the machine is between 0 and 12.5 mph and its incline range is between 0 and 15%, the user can upgrade the system to get up to 18 mph of speed and negative incline to experience downhill running. It is not everyday where you can find a machine that allows these alternatives. Obviously, the downside of the Woodway Desmo H treadmill is its price and its motor. For a $10,000 treadmill the 2.0HP continuous duty motor is definitely a little small. This would have been the perfect home/commercial treadmill if not for the mediocre motor. Getting the Woodway Desmo H treadmill means overspending. $10,000 is too much to spend for a treadmill. Given, it has winning features, stylish design, excellent performance and probably the best quality in a treadmill. However, you can also get a treadmill with similar qualities(although not as durable) from another brand (See True or Star Trac treadmills)with a much cheaper price. So before getting one, ask yourself: do I really need this luxury? If you plan on buying a Woodway Desmo H treadmill, I suggest you buy directly from the company through Woodway.com. You can get it for $9,995.